This is a posting about categorisation. It concerns the seven categories created for the Designs of the Year award which are: Architecture, Fashion, Furniture, Graphics, Interactive, Product and Transport. There is no category for services, which constitute a significant part of developed and developing economies. "Services" is of course a problematic term, an artefact of economic categorization that is perhaps too big to be useful. And it can be tricky to distinguish between where a product ends and service begins when you look at something like a car or a plane, where the servicing of the object and financing of the purchase may turn out to be more significant economically or in the mind of the consumer. As some management academics have suggested, the services category is everything services are not and that doesn't get us far. But despite the problems with the "services" category, I could not help wishing there was one when I looked at the designs proposed for awards. It's great to see the Design Museum shifting its awards from individuals to projects, bringing to public attention many interesting projects in diverse fields of activity. The list of nominees is now public. But the choice of categories, I would argue, matters because it shapes the conversation about how and where design matters. As Bowker and Star (1999) showed in "Sorting Things Out: Classification and its Consequences", classification has important consequences for individuals and for society. In Designs of the Year, service design consultancy Engine's work with Kent County Council on the Social Innovation Lab comes under graphic design, for example. Within the transport category, there are excellent, possibly world changing projects which include services wrapped around objects such as the San Francisco charge spot for electric cars. One of the entries (which I found in the booklet I picked up at the museum, but not on the website) - Streetcar - which was designed by consultancy live|work, does not mention them as its designers. My objection to these categories is that they serve to privilege and continue the object-centred way of thinking about design. Yes, you could say it's still the way of thinking of design that dominates design education. But Richard Buchanan's ideas of design thinking (1992), Victor Margolin's product milieu, Elizabeth Shove et al's Practice-Oriented Product Design and Guy Julier's Design Culture all point to different ways to think about design. Designing for Services: What do service designers do? A film I made about service design practice is now available online as a resource for teaching and research. The film was created as part of a multidisciplinary study entitled Designing for Services in Science and Technology-based Enterprises, led by me and Victor Seidel at Saïd Business School, and involving many of our colleagues as well as designers, science entrepreneurs and other academics from design and organization studies. A publication with contributions from many of these people and discussion of the project as a whole is available. 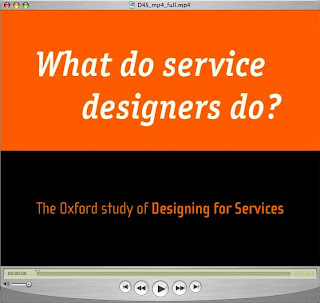 The film adopts a practice theory perspective to explore what is distinctive about the ways professional service designers go about designing or redesigning services. It follows in detail an encounter between London-based service innovation and design consultancy live|work, and g-Nostics, a company offering personalised medicine, which originates in science research from Oxford University. The film observes the designers as they go through some of the steps their design process, and finds that service designers do three things that distinguish their work from that of others. Firstly, the designers looked at the human experience as a whole and in detail. Secondly, they made the service tangible and visible. Finally, they created service concepts. This research was funded by the Designing for the 21st Century initiative funded jointly by the AHRC and EPSRC. Designers wary of social theories - imagining that intuition, or something like it, will produce good design - would benefit from being attentive to the work of sociologist Steve Woolgar. In his recent lecture on the occasion of winning the J. D. Bernal Prize by the Society for the Social Studies of Science (4S), Steve produced a thoughtful demonstration of how it's hard to talk about "the social" without talking about objects and how they are involved in constituting it. Many designers, of course, have the opposite problem - they find it hard to talk about anything but objects and aren't interested in what "the social" might be. Outside of social science, Steve is perhaps less well known than his close collaborator Bruno Latour, but he is an important figure. Their Laboratory Life (1979), is one of the most influential books in social studies of science published in the past 30 years. Steve enjoys telling people that his job title when hired at Saïd was professor of marketing. More recently - having along the way run whole events on the perplexing question of what Science and Technology Studies (STS) is doing in a business school - he has worked with Dan Neyland (now at Lancaster) on studying what they call mundane governance: looking in ethnographic detail at the now day-to-day, possibly boring objects that are involved in governance and accountability. 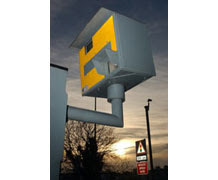 Their examples include things like speed cameras, recycling boxes, and bottles of water. The latter, for example, are turned into weapons of terror once you pass from one zone into another in an airport. Key questions for Woolgar are who, which and what, is accountable to what, which and whom? Once governance is not just about the governance of people, but also about the governance of things, then the categories (and practices) that constitute mundane, ordinary life, should be considered.